Marriage Jun 12, 1781 Ashby, Middlesex Co., MA, USA, Ashby VR & E. Cole: 12 Jun 1781, Ashby; married by Rev. Sam'l Whitman;Great granddaughter Lydia May Houghton gave Oct. 4, 1781 in DAR application. Death May 4, 1815 Baltimore, Windsor Co., VT, USA, "age 69"; Pollard: 4 May 1813; DAR: 1815 NSDAR; Thompson, Uran: 4 May 1815; MLM: May 5, 1815; [Baltimore was a village near North Springfield. ]; Uran: He dropped dead while he was working at his cobbling bench in his 59th year. Seth Houghton and Sarah Cole Wheeler declared their intentions of marriage on May 18, 1781 Fitchburg, Worcester Co., MA, USA; MLM: Asby. Seth Houghton married Sarah Cole Wheeler in Jun 12, 1781 at Ashby, Middlesex Co., MA, USA, Ashby VR & E. Cole: 12 Jun 1781, Ashby; married by Rev. Sam'l Whitman;Great granddaughter Lydia May Houghton gave Oct. 4, 1781 in DAR application. Sarah Cole Wheeler and Seth Houghton declared their intentions of marriage on May 18, 1781 Fitchburg, Worcester Co., MA, USA; MLM: Asby. Sarah Cole Wheeler married Seth Houghton, son of Elijah Houghton and Mary Andrews, in Jun 12, 1781 at Ashby, Middlesex Co., MA, USA, Ashby VR & E. Cole: 12 Jun 1781, Ashby; married by Rev. Sam'l Whitman;Great granddaughter Lydia May Houghton gave Oct. 4, 1781 in DAR application. Elijah Houghton and Mary Andrews declared their intentions of marriage on Aug 21, 1756 Stoughton, Norfolk Co., MA, USA. Elijah Houghton and Mary Andrews declared their intentions of marriage on Aug 25, 1756 Milton, MA, USA. Elijah Houghton married Mary Andrews in Sep 9, 1756 at Milton, Norfolk Co., MA, USA. Mary Andrews and Elijah Houghton declared their intentions of marriage on Aug 21, 1756 Stoughton, Norfolk Co., MA, USA. Mary Andrews and Elijah Houghton declared their intentions of marriage on Aug 25, 1756 Milton, MA, USA. Mary Andrews married Elijah Houghton, son of Ebenezer Houghton and Sarah Evans, in Sep 9, 1756 at Milton, Norfolk Co., MA, USA. 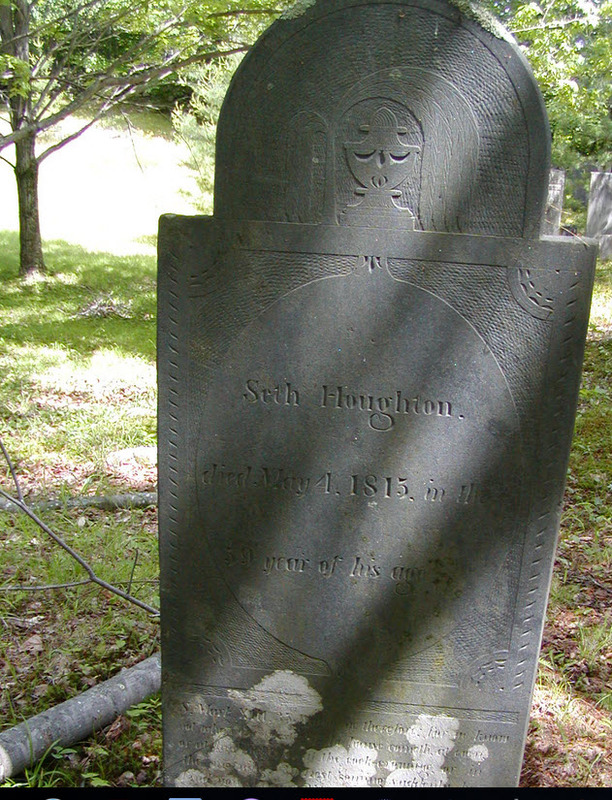 Death Jan 24, 1783 Milton, Norfolk Co., MA, USA, Milton VR: 86 years; JWH, FWH: 87 y; Jason Houghton: Jan. 24, 1783, age 87 y. 5 m.
Ebenezer Houghton married Sarah Evans in Sep 27, 1722 at Milton, Norfolk Co., MA, USA, marriage by Mr. Peter Thacher at Milton; Teele, MLM: Sept. 17, 1722. Sarah Evans married Ebenezer Houghton, son of Joseph Houghton and Jane Vose, in Sep 27, 1722 at Milton, Norfolk Co., MA, USA, marriage by Mr. Peter Thacher at Milton; Teele, MLM: Sept. 17, 1722. Joseph Houghton married Jane Vose in Oct 31, 1693 at Milton, Norfolk Co., MA, USA, Torrey: 1/wf, 31 Oct 1693, Milton/Lancaster. Joseph Houghton married Margaret Reding in Dec 8, 1708 at Milton, Norfolk Co., MA, USA. Birth Nov 21, 1668 Milton, Norfolk Co., MA, USA, Milton: Jan.
Jane Vose married Joseph Houghton, son of Ralph Houghton and Jane (? ), in Oct 31, 1693 at Milton, Norfolk Co., MA, USA, Torrey: 1/wf, 31 Oct 1693, Milton/Lancaster. Notable Ralph Houghton (~1624-1705) was the founding ancestor of the Ralph Houghton line of Lancaster, MA. Genetically unrelated to John Houghton of Lancaster MA. Marriage circa 1650 Unclear whether the marriage took place in England or Massachusetts; Torrey: ca 1650?, b 1653; Richard Houghton: around 1646-1647; Cope: "The marriage date I have for Ralph Houghton and Jane Stowe is bef 1647 (yours is c 1650). My grandfather wrote "He came to New Eng. about 1647 and lived in Woburn until about 1651 when he moved to Lancaster where he became a 'freeman' in 1656." Further on he added the note "m. in England". " 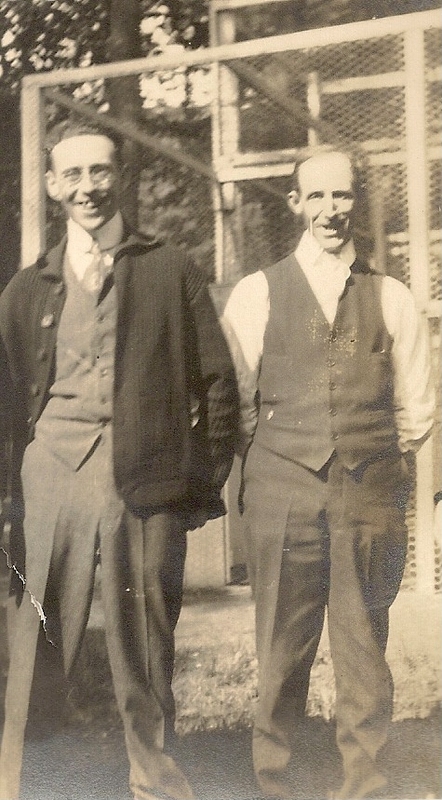 Allan N. Houghton: As to Ralph, if anyone has an idea what town he's buried in, I'd love to hear it. For one thing, Houghtons Pond was in Braintree not Milton, until 1754. What is now the town of Braintree was only the South Parish, formed about 1716 and that is the date of the oldest burials. What is now Quincy was the North Parish, they have no record of any Houghton burials before the 19th century. Milton cemetery records date only to between 1890 and 1927. The Metropolitan District Commision, which has owned the Pond since the 19th century, knows of no burials within that property. In other words, the stone is either a. elsewhere or b. disappeared between c. 1912 and the '20s. (it's not just Ralph, it's his wife children, grandchildren, several generations). There's only a half dozen Houghton graves in Milton Cemetery. Allan searched Milton cemetary in 2002 and 2003, two cemeteries in Quincy, and the 1715 cemetary in Braintree with no luck. In the same subject, Absolutely no sign of Ralph H, emigrant, wife Jane Stowe and a couple generations of children, either in Milton area or those that remained in Lancaster area (I've been through the Milton and oldest Quincy cemetaries stone by stone, remembering Houghton's Pond was part of Braintree, pre 1760s......what is now Quincy being the town of Braintree that Ralph knew, the present town of Braintree being the second parish, post 1715. The Pond and most land in all directions has been state owned for a century and more...there are no family plots. So where did Dr John H get the reported markings that are in the 1912 genealogy??? Ralph Houghton married Jane (?) in circa 1650; Unclear whether the marriage took place in England or Massachusetts; Torrey: ca 1650?, b 1653; Richard Houghton: around 1646-1647; Cope: "The marriage date I have for Ralph Houghton and Jane Stowe is bef 1647 (yours is c 1650). My grandfather wrote "He came to New Eng. about 1647 and lived in Woburn until about 1651 when he moved to Lancaster where he became a 'freeman' in 1656." Further on he added the note "m. in England". " Notable John Houghton (~1624-1684) was the founding ancestor of the John Houghton line of Lancaster, MA. Burial Old Burial Field Cemetery (Old Settler's Burial Yard), Lancaster, Worcester Co., MA, USA, Lancaster VRs, p. 401:"John Houghton deceased April 29 day 1684"; p. 399: "The oldest date now  to be found is that over the grave of the first John Houghton -- 1684. "; Whitcomb: Old Burial Field; Cutter [CJV, error]: Old Granary Burying ground, Boston Common; Gravestone: April 29, 1684, aged 60; Keizer, 1898: "The oldest date (1684) now to be found is that over the grave of the first John Houghton of Lancaster." ; Marvin: as of 1879, John and Ralph Houghton; p. 740, The oldest inscribed stone in the first burying yard, bears his name ; Worcester Co. Hx: "oldest date legible is that upon a stone marking the grave of the first John Houghton - April 29, 1684." CJV visit, 2002: personally photographed tombstones of "John Hovhton Decaesed 1684" and Memorial of son John; Louella Houghton Pringle has similar picture in 1938. It is clear that this is not the original stone given that Nourse, Marvin, and Arthur W. Clark (all pre 1950) all saw a headstone that read "John Houghton deceased April 29 day 1684", which is clearly not on the present headstone. Notable CJV: In 1913, John Houghton Memorial in Old Settlers Burial Field was erected by L. T. Houghton. Probably Lewis T. Houghton: "In Memory of JOHN HOUGHTON Born Dec. 24, 1624 Died Apr. 28, 1684. One of the founders of Lancaster. JOHN HOUGHTON his son One of the three men who purchased the land per the deed on other side Of this memorial tablet Erected 1913 by L. T. HOUGHTON A lineal decendant of JOHN." Notable is the original emigrant of the John Houghton of Lancaster MA line. 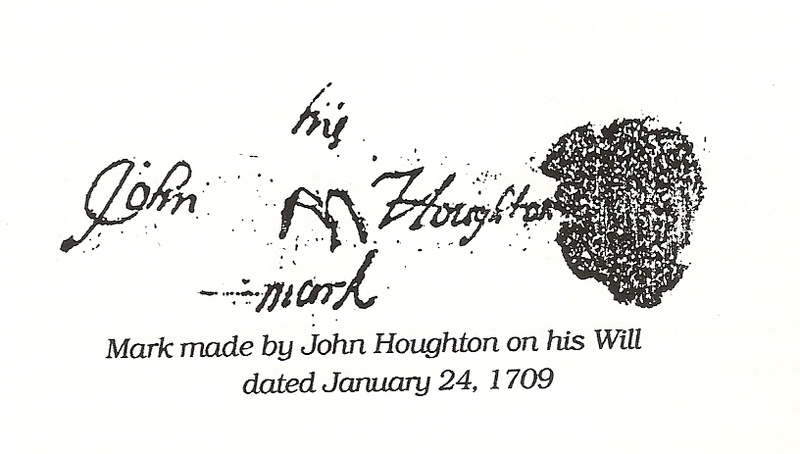 Notable John Houghton (~1660-1709) was the founding ancestor of the John Houghton line of Stony Brooke, NJ. Marriage Jun 20, 1678? Not in Torrey; The date is from Annie Schaffer's (of Sunbury, PA) DAR application (in Howard Houghton). Notable is the original emigrant of the John Houghton of New Jersey line. John Houghton married Dyna Phillips in Jun 20, 1678? Not in Torrey; The date is from Annie Schaffer's (of Sunbury, PA) DAR application (in Howard Houghton). Notable Elijah Houghton (1746-1830) was the founding ancestor of the Elijah Houghton line of Virginia. Elijah Houghton married Sarah Jackson in 1782 at VA, USA. Merle Elwood Wade married Elouise Morgan, daughter of James Hamilton Morgan and Lydia May Houghton, in Jun 14, 1917 at Des Moines, Polk Co., IA, USA.